John Bengtson is the author of Silent Traces, Silent Echoes, and Silent Visions, three books which take a fresh look at classic silent comedy films by revisting their locations today. Traces covers the films of Charlie Chaplin; Echoes covers Buster Keaton; and Visions (published May 2011) covers Harold Lloyd. The publications have gained much praise for their novel, illuminating approach to film history and simply because they are such a delight to look at. Bengtson has now gone online with Silent Locations, a blog that promises to cover ‘Chaplin-Keaton-Lloyd film locations (and more)’. It’s early days for the site as yet, but already there are some fascinating then-and-now photographs for films of each of the three stars, with instructive background information on location and production, plus the promise of other kinds of content to follow. For example, there is a downloadable PowerPoint presentation on classic Chaplin locations, with a frame still from the film inset within a photograph of the location today, which is as beautiful as it is informative. It’s going to be a site to keep an eye on. We can be so engrossed in what we see on the screen that we can forget that there is more to the movies than stars and stories. Every film made is a time capsule. The way people look, dress, talk, interact with one another, the social assumptions that are made, the places they live in, visit, work in, the functions and histories of those places, the transport they use, their hopes, fears, loves and hatreds. Few history books are able to pack in as much as a film does, if we are prepared to look. This unique accumulation of insight and information, of fact and fantasy, has created a vast resource for the study and appreciation of London. It offers us a largely unprobed field for a new kind of urban archaeology: the archaeology of recorded action rather than of surviving artefact. It was Colin’s great frustration that he could mostly only present his ideas through still images, and that even when a film was running he could not find the means to fix associations between what was on the screen and the links he detected with other histories that lay in his head (he might have been able to do so much more with today’s computer software). It isn’t that films belong in the museum so much as films are a museum – it’s just that we so seldom take the time to look at them in that way. The ebb and flow of city life continues throughout the day and night. Paths cross and the diverge as people go their different ways … [T]he coffee stall, now a vanishing feature of London life, once provided a unique meeting place where people of all types and classes rubbed shoulders for a few moments, refreshing themselves with a drink and a sandwich. So the setting has a historical, symbolic and practical function – the latter being that it makes for a good point at which to bring together disparate characters, and one with strong character recognition. Of course, there is much more. There are the dowdly, well-worn clothes of the Londoners. Everyone wears hats, all the man have buttoned-up shirts with ties. There is the stall itself (evidently horse-drawn even though this is the 1920s), its pavement location, its wares and its advertisements. But also running through the image is a history of British filmmaking, from the assertive Britishness of the film’s title, to the contrary fact that the lead performer is an American (Dorothy Gish, on the left), typical of many an American star with a career on the wane being snapped up on the cheap by a British studio. But she is a Gish sister, so embedded in her image is a whole history of narrative cinema that comes out of D.W. Griffith. And London was based on the London stories of Thomas Burke, another of whose novels inspired Broken Blossoms). Or we can just look at the coffee cups and think that, apart from the size of the cups, maybe there’s not that much about London life that has changed after all. 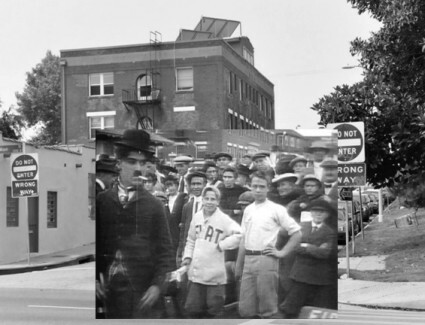 John Bengtson has done an excellent job showing how traces of the past exist in the locations of today, and by showing past and present side by side he makes us think historically. But it’s not just the stills but the films themselves that we need to annotate in a far richer form than we have achieved so far. Film’s special capacity for encapsulating times past and creating associations between where we are now and where we once were needs not just to be acknowledged but to be documented. Otherwise the history will be lost. Oh dear, I do apologise. Correction swiftly made. Congratulations on the site – I’m looking forward to seeing how it grows. 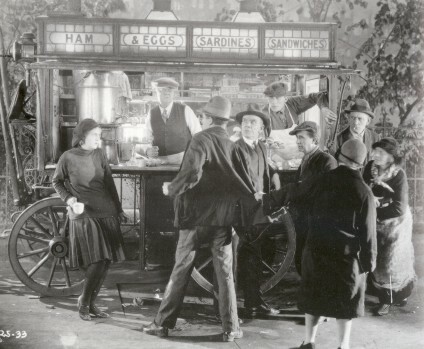 Lovely still….and what a film that would be to find; but would the stall really have been horsedrawn ?? Yes, the poles are there (is that the term?) but you also see them on the twice-a-week traditional street markets in South London to this day….and they are always hauled to and from their lock-ups by the stallholders, generally with a caravan of irate motorists following them. I suspect a scene that hasn’t changed for over a hundred years…. I think you’re right, though it looks like it could have been horse-drawn. And it would have been quite a challenge for a mere human to shift it. Thank you indeed for the link to your work on Paul, and on mapping films to cities generally. There’s some really interesting work going on there. What a wonderful site. I’m going to be spending a lot of time there. As to the still from London, I’d say the stall looks heavy enough to have required horse power. The smaller wheels in front and larger in back were a common feature on horse-drawn vehicles. Similar lunch wagons in the US tended to get placed in one spot and rarely moved. What a nice site, Roland-Francois. A great complement to the Paul DVD! I think a post will have to follow on the Cine-Tourist, or at least one inspired by it since it is only marginally about silent films. We’ll come up with something. The CineTourist will be visiting more silent films shortly. This summer there’ll be some location identification and then mapping re. Feuillade’s Vampires (tomorrow’s Daily Map will be from that).